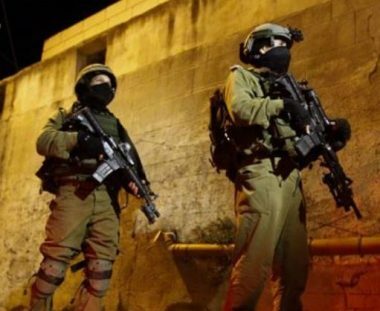 The Palestinian Prisoners Society (PPS) has reported that Israeli soldiers abducted, on Tuesday at dawn, at least thirteen Palestinians, and injured one, in several parts of the occupied West Bank. Media sources in Tulkarem, in northern West Bank, said the soldiers shot a young man in Qaffin town, north of the city, during protests against the invasion. The soldiers also invaded the Deheishe refugee camp, south of Bethlehem, and attacked many protesters. In addition, the soldiers attacked and injured Qassem Salim, 25, after invading his home and ransacking it in Azzoun town, east of Qalqilia, in northern West Bank. In Hebron, in southern West Bank, the soldiers invaded many neighborhoods in the city, and installed roadblocks at its northern entrance, in addition to Sa’ir and Halhoul towns, before stopping and searching dozes of cars. Ismael Ramadan, Deheishe refugee camp. Mohammad Adawi, Deheishe refugee camp. Mohammad Salim Thawabta, Beit Fajjar. Odai Haitham, Deir Abu Mashal.